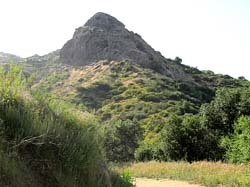 Bee Rock (1056') is a massive outcrop of cavernous sandstone jutting from the mountainside on the west end of Griffith Park. This beehive-shaped rock is a prime example of the types of marine sedimentary rock that are widely exposed throughout the eastern and middle Santa Monica Mountains. On December 16, 1896, Colonel Griffith J. Griffith donated 3,015 acres to the City of Los Angeles to be used as a park. In 1903, while Griffith served on the City of Los Angeles Parks Commission, a half-mile dirt road was built from Crystal Springs to the narrow canyon at the foot of Bee Rock. On one occasion Griffith led an excursion of park commissions to a "high point" to view the east end of the park's landscape. According to historian Mike Eberts, this highpoint was probably Bee Rock. On May 22, 1904, the parks commission officially renamed Bee Rock as Harper's Rock, but the name never stuck. This 2.2-mile loop hike begins at the merry-go-round parking lot, ascends Old Zoo Trail (a dirt road) contouring west then north through Spring Canyon above the old zoo, turns west on Bee Rock Trail which proceeds a quarter mile as a dirt road, then turns into a narrow trail that ascends steeply through jungle-like vegetation to the ridge connecting Bee Rock with the mountainside. The views from Bee Rock are splendid, but unfortunately you are looking through a 7-foot chain-link fence. You will retrace your steps to the junction beginning of Bee Rock Trail, pass through a chain-link fence and walk through the old zoo grounds to return to the merry-go-round parking lot. An alternate route adding about 1.5 miles to the hike uses Eckert Trail. From the large parking lot near the merry-go-round, walk back south to the entrance of the lot. (Note at this point, a barrier and gate blocks the road from vehicles traveling any further.) Turn right, passing the road barricade and walk about 75 yards up the paved road and notice a trail on your left heading up the canyon. This is Fern Canyon Nature Trail. Walk another 50 yards and see a dirt road veering to the left (the paved road bends around to the right). This is Fern Canyon Trail. Take this trail. In about 80 yards, ignore the first turn on the right (this will be your return route). Walk another 60 yards as the trail bends left (south) and turn right at the junction unto Old Zoo Trail (not to be mistaken from road that meanders through the old zoo). You ascend north as views begin to open up to the east. In a few minutes you reach an outward bend that cuts back sharply southwest to begin a traverse through Spring Canyon. The grade is gentler now as you contour along the hillside. You get glimpses below of the road coming from the old zoo, which will be your return route. Soon you get your first look at Bee Rock high on the slope above. The trail begins to descend to Spring Canyon stream. A spur trail cuts right following the creek down toward the old zoo. Across the stream as the trail bends the northeast. In few more minutes you arrive at a four-point junction, 0.7 mile from the start. Straight and bending right leads to Mineral Wells Trail, and in about 100 yards the junction for Bill Eckert Trail (this is an alternate route for your return trip). To the immediate right along the chain link fence is a narrow path that will be your return route through the old zoo. To the left is Bee Rock Trail (still a dirt road) heading west up a ravine. This is your route. The trail begins to climb more steeply now but you get some shade from some mature oaks. At 0.25 mile the road bends left and ends. A narrow trail cuts back to the left. Now you get to hike! Follow the trail climbing southward through rich vegetation and some views of the urban sprawl to the east. In a few minutes you reach a junction. Both routes will get you to your destination, but the path cutting hard right is the main route. Proceed northwest and in a few minutes the trail cuts back southeast. When you reach a fork stay left. There will be a couple more switchbacks before you head south toward Bee Rock. There are some concrete steps to aid in the final pitch. When you reach the ridge with a fence, you are almost there. Turn left and follow the path along the fence about 100 yards to the top of Bee Rock. The views from Bee Rock are amazing, unfortunately, you have to look through a seven-foot chain link fence! You get a bird's eye view the network of trails below. To the south Vista Del Valle Drive cuts across the mountain below Hogback ridge. To your southeast, Beacon Hill calls you to come and hike it. After you have enjoyed this setting, return down Bee Rock Trail. When you reach the four-point junction at the old zoo fence, you'll notice that the dirt road on the right was your earlier route to here. But to complete the loop, bear left momentarily and then right on the narrow path along side the fence. Follow the path briefly and turn right, passing through a pedestrian gate in the fence to the paved road. 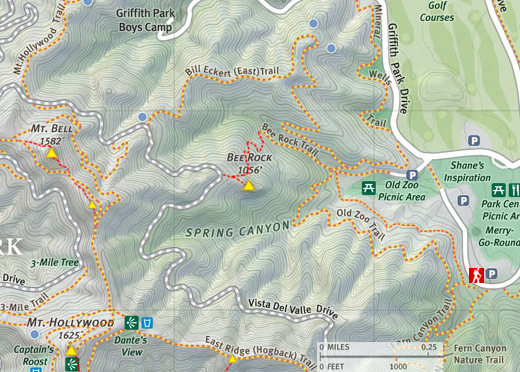 A left turn (east) would take you about 0.3 mile to Griffith Park Drive. But continue straight (south) proceed through the old zoo grounds, keeping the grass areas to your left. This pastoral setting offers a nice place for a picnic or just relaxing. In a couple minutes the route circles left (east) and you see some of the old zoo cages. 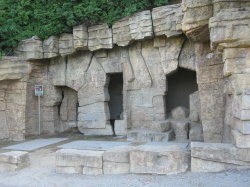 A sign states that the area served as the city's zoo from 1912 to 1965 and that many of the walls, grottos, and other enclosures were built in the 1930s. The development of zoological sciences renders the historic enclosures no longer appropriate for housing animals. When you come to a fork in the road, bear right and immediately notice another split with a road veering right. This will be your route, but first you may want to continue left another minute and see some of larger zoo enclosures. Back at the split, take the road that veers southeast (behind the zoo enclosures). Soon the pavement ends and the dirt road roughly parallels Old Zoo Trail (that you were on earlier) and takes you 0.25 mile back to intersect the beginning of Fern Canyon Trail. Turn left and retrace your steps to the parking lot. An alternate route adding about 1.5 miles to the hike uses Bill Eckert Trail to descend. From Bee Rock, proceed west back along the ridge, pass the trail you came up, and in about 50 yards arrive at Vista Del Valle Drive. Turn right and follow the paved road about 0.5 mile to the upper terminus of Eckert Trail (#14). Bear right onto the dirt trail. You'll pass below a water tank (113) and proceed roughly in a northeasterly direction down a ridge. You'll have some views of the sprawling northeast corner of the park. In a while you'll pass a large white water tank (76) as the trail bends south. In a few more minutes the route bends west and Bee Rock comes back into view high above you. Shortly you arrive at a junction with a Bill Eckert Trail sign. Turn right (west) and in about 100 yards you arrive at the junction of Bee Rock Trail and Old Zoo Trail. Turn left on the narrow path next to the chain-link fence. Follow the directions above for your route through the old zoo. See my blog post for Old Zoo Park to Bee Rock and Mt. Bell (March 13, 2014) and descent via Bill Eckert Trail; also link to photo album. Day Hikes Around Los Angeles - by Robert Stone (Day Hikes Books: Red Lodge, 2003). Hike 72: "Bee Rock and Old Zoo Park." Trail description of a 2.2-mile loop hike with 300 feet in gain. Actually, it's about 600 feet in gain! And his description and map are somewhat scant and inaccurate. Day Hikes in the Santa Monica Mountains - by Robert Stone (Day Hikes Books: Red Lodge, 2012). Hike 3: "Bee Rock and Old Zoo Park." Historical background and trail description of a 2.2-mile loop hike with 600 feet. He has corrected the problems that are in the 2003 book (above) and his description and line map are now accurate and reliable. He expanded his write -up, borrowing extensively from my write-up. Afoot and Afield in Los Angeles County - by Jerry Schad (Wilderness Press: Berkley, 2000). Area B-6, Trip 3: "East Side Loop." Trail description of a 5.9-mile hike ascending Old Zoo Trail and Bill Eckert Trail to Mt. Hollywood, and descends Hogback Trail and Fern Canyon Trail. His map wrongly labels Old Zoo Trail as Hogback Trail. This page was last updated August 6, 2015.